Picture in your mind, three men travelling together around Cornwall - one gains fame amongst us common folk for painting a picture of his mother, another gains notability because a few people believe him to be Jack the Ripper and the third remains a relatively unknown Australian born artist whose career was enhanced most definitely by his family retreating to Europe from colonial Australia but also in his meeting of the first of the trio. So who are they? Jimmy Whistler was a brilliant artist, though probably somewhat disturbed. And he was certainly one of the stormy petrels of the art world, setting the path for artists to stand up to the highly political art scene of critics, dealers, patrons who could destroy an artist with a few words. His works represent a break away from tradition and a move towards Post-Impressionism and abstraction, often titling his works using musical terms such as symphony, arrangement, nocturne. In essence he was interested in tonal compositions and in manipulating paint. My favourite quote attributed to him is: To say to the painter that nature is to be taken as she is, is to say to the player that he may sit on the piano. You can read these biographical notes if you would like to further your research. I want to show you a little of the development of his craft through his fashionable portraits for which he is well known exemplifying his mastery of a tonal palette. Symphony in White No 1 was painted in 1862. The Princess from the Land of Porcelain was completed 1865 and shows the influence of his interest in Japanese art which we will discuss in a later Blog. 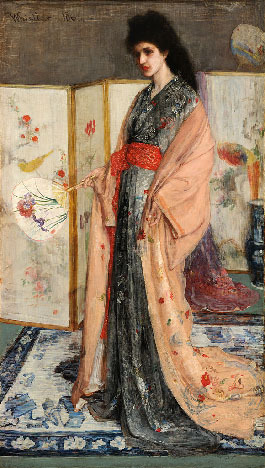 Harmony in Pink and Grey, 1881, shows his increasing desire to show his ability to control the colours he uses. 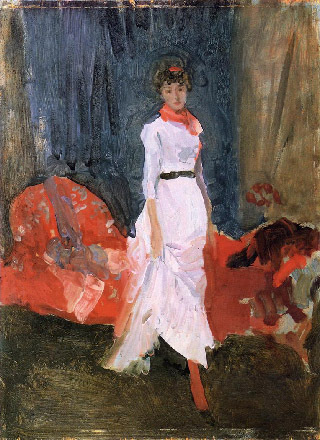 Arrangement in pink red and purple (1884) still shows Whistler's expertise in drawing the female figure but his style has changed to Impressionism. 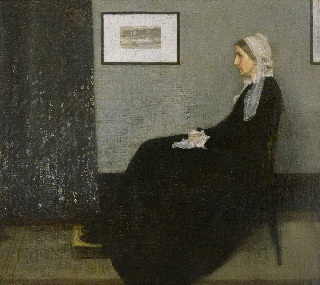 http://www.jamesabbottmcneillwhistler.org/ Don’t underestimate his contribution to modern art as we can draw a line from Whistler to Jackson Pollock where the artist sees the medium as foremost in the painting not a conventional subject such as a person, building, scene. 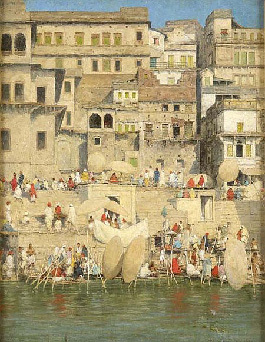 Now to the third member of the trio, Mortimer Menpes (1855-1938) who was born in Adelaide but his family didn’t much care for the colony and returned to England in the 1875 allowing Mortimer to study at the London School of Art. 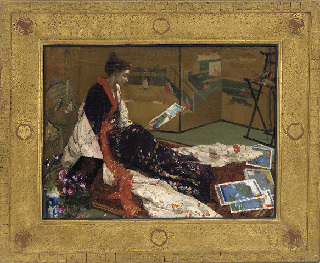 Mortimer first met Whistler when travelling in on a sketching tour of Brittany in 1880. 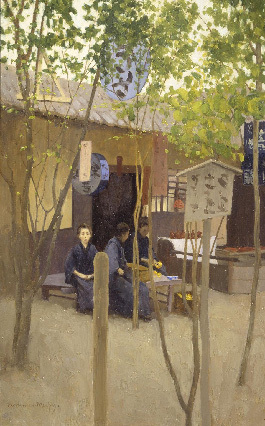 Although Menpes denies that Whistler was his teacher there can be no doubt that Menpes was influenced by Jimmy Whistler particularly in terms of his interest in Japanese art. I love Flower of the Tea for its delicacy of title, brush stroke and tonal control. 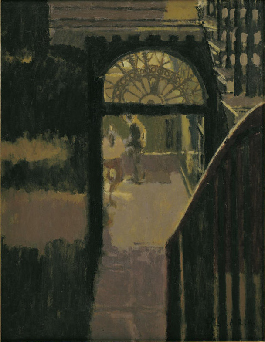 Menpes doesn’t seem to have suffered from any mental problems so maybe he was the calm one when on outings with Whistler and Sickert. 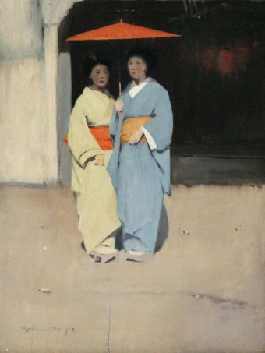 Menpes friendship with Whistler apparently broke up when Whistler became offended that Menpes had not only visited Japan but fallen in love with the country which apparently Whistler believed was reserved solely for him! Menpes wasn’t in Whistler's league in my opinion but I want him remembered as Australia's first internationally recognised artist and also for being one of our war artists as he travelled to South Africa to paint the Boer War. We will return to look at the war artists in a later Blog. Also both Whistler and Menpes were wonderful dry point etchers and we will return to study these works as well. Read this interview with Mortimer Menpes to gain a deeper understanding of the man behind the brush.